Many of the timepieces Riabov restores were made as far back as two centuries ago. Riabov works out of a studio at his home in Landenberg. In John Riabov's work studio, connected to the Landenberg home he shares with his wife, Darelle, there is a continuing timbre of sounds that call to mind childhood visits to a grandmother's home, when chimes rang every 15 minutes, as if celebrating the passage of time. These are the sounds of Riabov's profession, and some would say, his passion. Since 2010, when he began Wyndwood Tyme, an heirloom watch and clock repair company, he has spent his time embracing the nuance of precision -- the intricacy of getting measured machines of time to work again. He is booked solid these days -- the number of repairs he has on his plate right now will keep him busy for the next four months -- but to see Riabov in the quiet of his well-lighted studio, with the sweeping landscape of Landenberg outside his windows, is to see an individual consumed by the quiet efficiency of getting things done. "I've always been analytical, a problem solver, and when it comes to problem solving, I am patient," Riabov said. "I have good eye-hand coordination, I'm very disciplined, and I love small details. It was almost as though I was meant to do this." Lest you believe that Riabov was born into the profession of clock and watch repair by way of some weird osmosis, or some mystical connection to the elements of time, nothing could be further from the truth. He spent most of his professional career in the agricultural field for several leading companies, and then entered the advertising business, where his clients were mostly his colleagues in agriculture. For several years, Riabov was the executive director for a non-profit organization that helped organizations improve their business management and operations. When the economy began to tank in 2008, the grant money to the organization began to dry up, and for the first time in his adult life, Riabov found himself without a job. So he took a test. "I decided that I had something else I wanted to do with my life, so I took a career interest profile and found that I had a lot of technical acumen that I never pursued," he said. "Included among the professions that were suggested in the profile were cabinet making, working as an electrician, and yes, clock and watch repair. So I talked about it with Darelle, and I made a decision that has ultimately changed my life." In 2008, Riabov entered the National Association of Watch and Clock Collectors [NAWCC] School of Horology in Columbia, Pa., and over the next 18 months, he studied the science of horology five days a week, logging 2,000 hours of instruction and as an apprentice. During that time, he and his wife had a commuter marriage; he rented a room near the school. He was not alone, however; among his classmates were a retired orthopedic surgeon, a retired fighter jet pilot, a retired chemical engineer, a motorcycle mechanic, and a tech school graduate. "We were all linked by our innate ability to understand the technical aspects of the job and the intricacies of parts," Riabov said. "Even though I worked in environments that involved teams in the past, surprisingly in my profile, I have a personality that works best by myself. I'm passionate about doing things right, not being pressured, with the idea that I want it to be fixed so that it doesn't have to come back to me." During Riabov's 18 months at the school, Darelle made several visits while school was in session. She recalled an intense, workshop atmosphere. "On one visit, I saw a total of seven students, all with projects going, and all kinds of clocks were chiming and ticking as they worked," she said. "I brought along my laptop to get some work done while they were head-down into their clocks and watches, but there was so much noise that I couldn't concentrate. I looked up, and there they were, working away as though the room was perfectly silent. "That's when I knew that this would be more than just a hobby for John, that he was truly committed to his work, and that it would give him so much happiness." "I saw a need for this," Riabov said. "By the time I got finished with school, I thought that the economy would become better, and allow people to have a little more discretionary money to fix the grandmother's clock that they had just inherited." In the world of clock and watch repair, the uniqueness of the profession often avails itself to great discovery. Riabov said that he looks at his job as more than just dusting off old things in order to get them to work again; he's part historian and detective, appointed to uncover long-held truths and solve mysteries, often in collaboration with others. Such was the case of a seven-foot-tall clock, made somewhere between 1780 and 1790, that found its way into Riabov's studio in 2010. 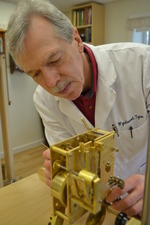 It had been in storage for nearly 40 years at the University of Pennsylvania, and after receiving it from the Robert Treat Hogg Cabinet Shoppe, Riabov began cleaning the clock in his studio. Enter antiquarian horologist M. Gregg Perry, a former classmate of Riabov's, who worked with Riabov and the Robert Treat Hogg Cabinet Shoppe to restore the clock to its original condition, including the restoration of a moon dial. The original dial on it had been painted over, the moon dial was in poor condition, but what made the clock a hidden treasure was not only defined by its age, but by what Riabov saw inside - a hand-inscribed signature: Isc. Jackson Newgar. with three tiny letters "den" written above the "Newgar" due to lack of space. Riabov pored through the internet, looking for the name Isaac Jackson. Who is this guy, and what about the peculiar "Newgar" tacked on the end of his signature? In Jackson’s career, Riabov read, he lived in New Garden Township, and in fact, the clock may have been made less than two miles from where Riabov lives. "I thought, 'This is unbelievable," Riabov said. "'This is meant to be.'" Jackson had made 27 known clocks, Riabov discovered, but the one he was helping to restore was not among those on record, nor did it resemble any of those he saw in books. Riabov went to the Chester County Historical Commission. He saw photos of some of Jackson's clocks. There wasn't a moon dial among them. So why did this clock have one? After months of research – time that he spent as part clock repairman, historian and sleuth – Riabov speculated that the moon dial was installed at the request of Jackson's customer. The clock, now fully restored and working, is in a private home in Villanova, Pa. It's Riabov's responsibility, he said, to tell owners about the history behind these timepieces. "It's part of the clock, part of the history that families need to know," he said. We live in a throw-away culture, the proof of which is never more evident than what we wear on our wrists. Once, the watches we wore helped define us; often, they were family heirlooms, treasures passed down as honored possessions. Now, anyone can plunk down thirty bucks in a drug store and get a watch that will last for maybe a year or so. Riabov knows this; the ache of our disposable society really bothers him, and almost in defiance, he pointed to a 200-year-old clock on the shelf of his studio. He opened it. It is handmade, and its wheels and levers and pulleys were exacting, the perfect assimilation of idea turned into intricate function. Everything that was seen -- fans, bells, strike hammers, the time barrel, the wheels, pinions, the rack, the snail and the teeth -- was originally placed there in the early 1800s. It's like this, all the time, in Riabov's studio. With each timepiece that comes to him, so too, does a personal story that owners love to tell him. “The real satisfaction is bringing everything back together and seeing it come alive again," he said. "When I work on a watch, after everything's been properly cleaned, reassembled and oiled, and then the balance wheel goes in, it begins to move again. It's like a heart, beating, and I have helped bring it back to life."